I started riding my bike to work and to other errands for fitness, health and reducing my carbon footprint. After being car-lite for a few weeks, I found a new motivation in being independent from cars. That is what drives me most now. My work commute is 2 miles one way. I come home for lunch, so I get almost 10 miles a day. I commute around 260 miles a month on my bike (and 170 in the car). Bike commuting saves me $150 a month in gas money alone. (see details here: link ). I have lost some weight. I feel energized and ready-to-go when I get to work. I feel very active now. Overall, my quality of life has definitely gone up. I am a Logistics Engineer and work for a contract logistics company (3rd Party Logistics). I am not in IT. I work and live in Jacksonville FL’s Edge City. 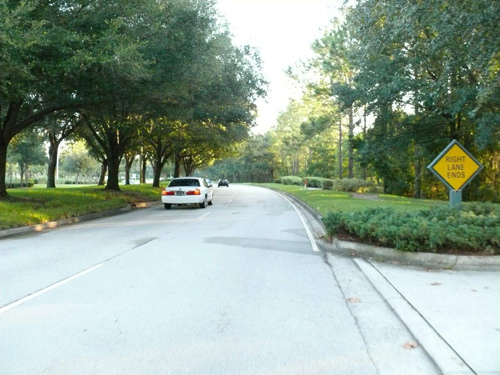 It is the part of Jacksonville south of the river built around the JT Butler Blvd. primarily for office complexes. 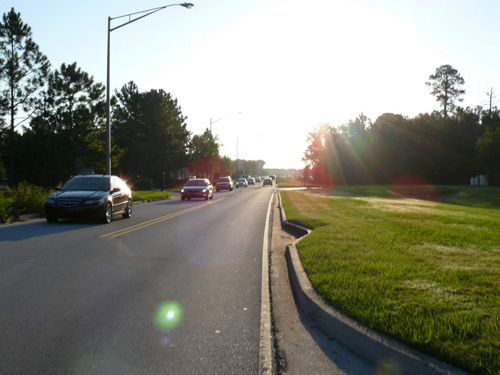 The commute to work is lined by manicured lawns and trees but no bike lanes. Housing in this area is in the form of large sub-divisions with winding roads. This whole part of town is very car-dependent (Walkscore gives it a whopping 28 out of 100). Oh, the joys of having suburbia within city limits! I have a 12+ year old Specialized Rockhopper Comp that I bought from my friend. He bought it when he was a teenager and it has been sitting in his garage since then. The bike was well kept, has no rust and is sturdy as a rock. I have replaced the knobby tires with slick road tires. This bike is the work mule. It has plenty of low gearing to haul groceries in a difficult head wind. Once I sell my car, I may convert this to an Xtracycle or buy a complete long tail. Right now, my Banjo Brothers waterproof panniers do the job. A crate of 12 cans of dog food or a 12 pack of Heineken fits nicely on the bike’s rack. A bag of dry dog food is what I cannot carry yet. I am sure the Xtracycle will solve that. I also use this for my 5+ mile rides. My other bike is an Amsterdam. It is an old city bike, probably from the 1960’s and 1970’s. It has a French flag on it but I dont know if it is French or Danish. It is an old-school single speed bike with a coaster brake. It is also my primary mode of commute to work. I wear business casuals on Mondays and Fridays and business formals (dress clothes and a tie, no jacket) on the other three days. This one lets me hop on the bike and go. I don’t have to be hunched over the handlebars and fold up my dress pants. I get a lot more respect on the road with this one than on the Specialized. I rarely get honked at. This bike has a generator on the front wheel and it powers the headlight and taillight. It is almost perfect for a short leisurely ride if you are not trying to break the sound barrier. The 5 way OYB bag switches bikes depending on which one I ride. It holds my extra tubes (2 sizes, one for each bike), an adjustable wrench and a cloth napkin to wipe off sweat. I carry the wrench to fix a flat on the Amsterdam bike though I hope the rear tire does not get a flat. It is a big pain to remove. 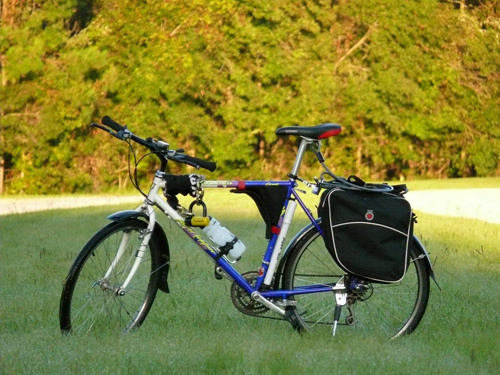 The panniers are exclusively for the Specialized. They come on only when I have to buy groceries or pick up clothes at the dry cleaners. I recently bought a Solvit Trackr large dog trailer for my 60 Lb greyhound. Laya has begun to grow fond of it and it will be mostly used for trips to the vet or the dog park. It is a tight fit if she stands and she has not started to lay down in it yet. I recommend it for your pets. The people at the local Panera Bread were very amused to see my “Drink Beer Not Gas” T shirt (designed by my co-worker Matt Martin at nopollutecommute.com). Maybe the next time I will get a free souffle! They thought I was crazy when I started riding to work. Most didn’t think I would last over a week. They gave me stories about bicycle crashes, motorist negligence and failed bicycle commuting attempts of other people, pretty much every play in the book to dissuade me. I even got a lot of resistance towards riding on the roads as opposed to sidewalks. Some still think that I impede traffic. They got a lot more supportive after the first two weeks of riding. I keep getting offered rides. Even the VP of my department has commended me for it. Motivated by my gas savings, a good friend and coworker got himself a bike and started commuting 3.5 miles on way. He has stopped for a while due to the uncertain rains and storms as he carries a laptop. Now that I am getting close to going car-free, I get a lot of criticism. Friends and coworkers do not think that is possible. They ask me if I am going to start hunting for my own food too! I have a log (http://www.sheksfootprint.com/car-dependency ) of all the times I drove my car since going car-lite and I can do all of those by car-pooling, xtra-cycling and hiring a taxi. 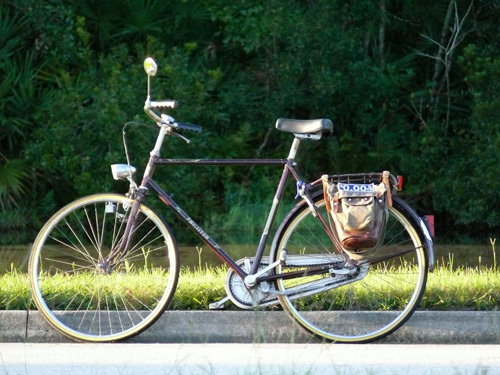 I participate in Bikejax. It is a blog hosted by Matt Uhrig in promoting bicycle commuting. There aren’t really any bicycle commuting advocacy groups in Jacksonville FL and I am not into racing and mountain biking. In my journey to commuting by bicycle, I am surprised to how dependent we have become towards the car. It is a very good convineance but we have made it a necessity. There lies my fundamental problem with cars that they are an expensive depreciating necessity. I hate to lift cars up in the ranks with shelter and electricity. I recommend everyone to read the book “Divorce your Car” by Katie Alvord (editor’s note: I will be reviewing this book in the coming weeks). It is a fantastic history lesson explaining America’s dependency on oil and cars and suggests a lot of methods for living car-free or car-lite. I also see a shortage of understanding with the general public that a bicycle can be used for commuting. Most are of the opinion that bicycles are for racing, mountain biking or just plain riding. The majority of people here in Jack-sprawl-ville do not understand that concept of riding your bike for something more meaningful like going to work and groceries and visiting friends! That is a big change in mindset and culture that I hope happens if we are to be truly independent. We’d like to thank Shek for contributing his profile and his photographs. To get even MORE Shek, spin on over to Shek’s Crib…his own blog, links to his photos and a whole lot more. Another great profile. Each rider has a unique take on things. 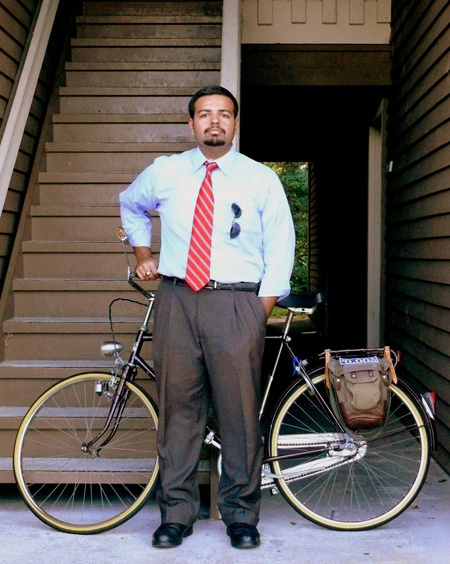 I’ll forward this story to my coworker who believes that having to wear a tie and dress slacks prevents him from bike commuting. Good stuff. Such good points, I too have noted people who can’t wrap their heads (so to speak) around the idea that its really true; a person can ride to work, to the store, out to dinner, to the post office, basically everywhere. You must be _____ fill in the blank, cold/tired/hot/late….. Living closer to work really helps. I will probably be the town wierdo when I go car less. I dont know any person in my part of town (younger or older than me) who thinks a bicycling is a mode of transport and it can be efficient. The culture in Downtown Jacksonville is better but Downtown is 12 miles from work. I have to pick my battles! 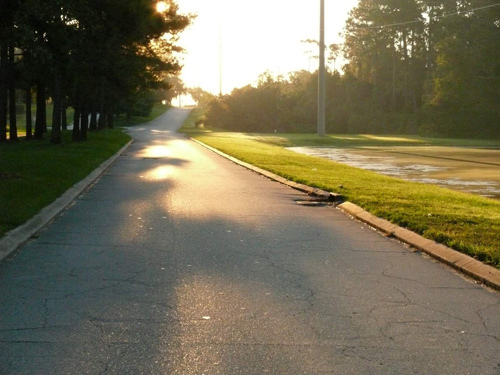 I’ve been riding my bicycle to the office since moving out to the beaches area of Jacksonville. It’s a 2-mile ride one way. The driving force behind using my bike was my truck was inoperable and I didn’t want to fix it nor buy a new car since I hated the thought of using gas and I’m not lazy by any means. Most of the excuses I hear are, “It takes too long”… The solution to that is to “leave earlier”. It’s healthy as well as calming on the way to or from the office. Buy a bike and get out there! Great story Shek! Don’t listen to those “friends” give you advice about going carfree, it has been one of the most exciting decisions I made two years ago and made a whole world of difference when it comes to worrying about money, as in- I don’t have to!! I, like you, just want to get a cargo bike such as the new xtracycle Radish to complete my “fleet”. I ordered the freeradical kit for my specialized on Sunday (after I was sober enough to order the right quantity after Saturday night’s festivities). The radish is pretty cool looking. That was one inspiring read! More power to you. Now that I lost my shirt (and pants, socks and shoes, too) in the stockmarket, maybe I can convince my wife we can’t afford a car anymore. Where I live (Hokkaido, Japan) is quite a bit colder than Florida, but I am going to bike-commute right through winter anyway. Good for you Stuart. I will be facing my first winter (Florida winter!) on my bicycle soon. After spending four years in a “bicycle friendly city”, HA HA, I’m thinking about moving back to Jacksonville. When I lived there during the 80’s I was a motorist. One big difference is I remember more people driving safely.. Up here NO ONE follows the simplest traffic laws and most bike lanes are not as wide as the handle bars.. so, part of the bike is over a sidewalk and the other is in that main travel lane. Motorist get mad because I don’t ride in those lanes.. I’d be better off with NO BIKE LANE.